Robert de Montesquiou was entranced by this character who was not unlike him. An Italian aristocrat living in Paris, glittering lioness of the Second Empire, Napoleon III's mistress, the divine comtesse lived afterwards as a recluse, going out only by night, veiled in black. 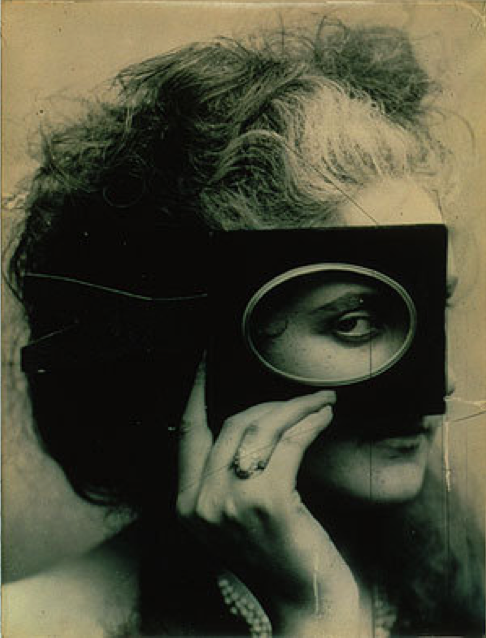 With Pierre Louis Pierson's help, she was her own photographer : some five hundred shots celebrate her image, her costumes, her body, her attitudes, according to a ritual she entirely determined, with a surprizingly modern formal invention. 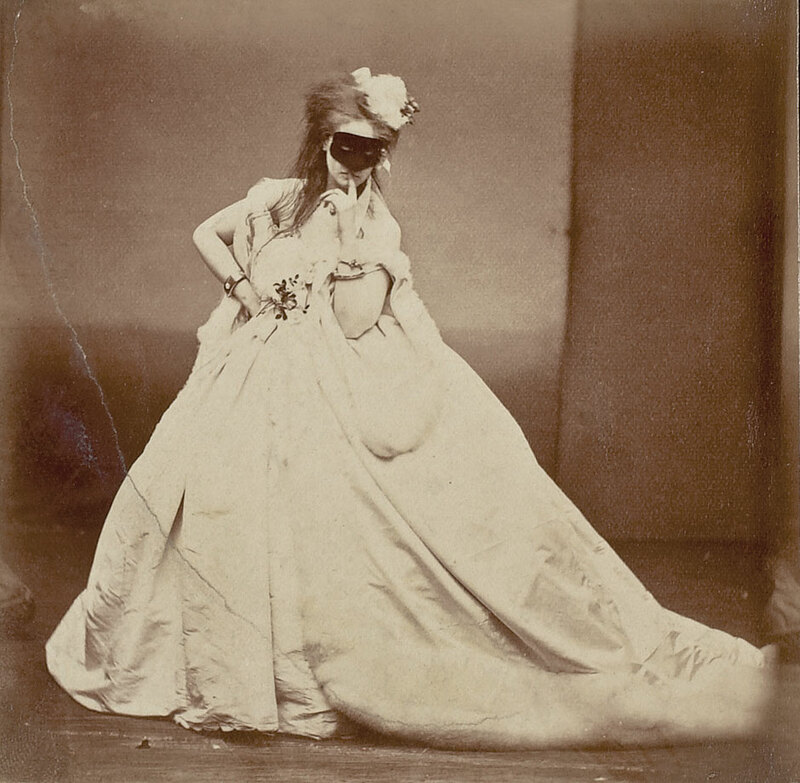 The name of Virginia Oldoini, Countess of Castiglione, is linked to Second Empire political and courtly intrigues, to the glamour of the Court at the Tuileries and to the splendour of a cosmopolitan Paris, the world capital of fashion and pleasure. Born in Florence in 1837, Virginia Oldoini married the Count Verasis de Castiglione very young. 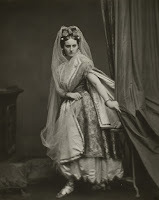 A cousin of Cavour and a close relation of Victor Emmanuel of Savoy, king of Piedmont, she was sent to Paris in 1856 to plead the cause of Italian unity with Napoleon III. Her arrogant beauty was a sensation at court. During the same year, she became the emperor's mistress. In 1857, after a heart-breaking rupture, she went back to Italy. She was not to come back to France to settle there permanently before 1861. Separated from her husband, she then had many liaisons in the world of finance, aristocracy and politics. 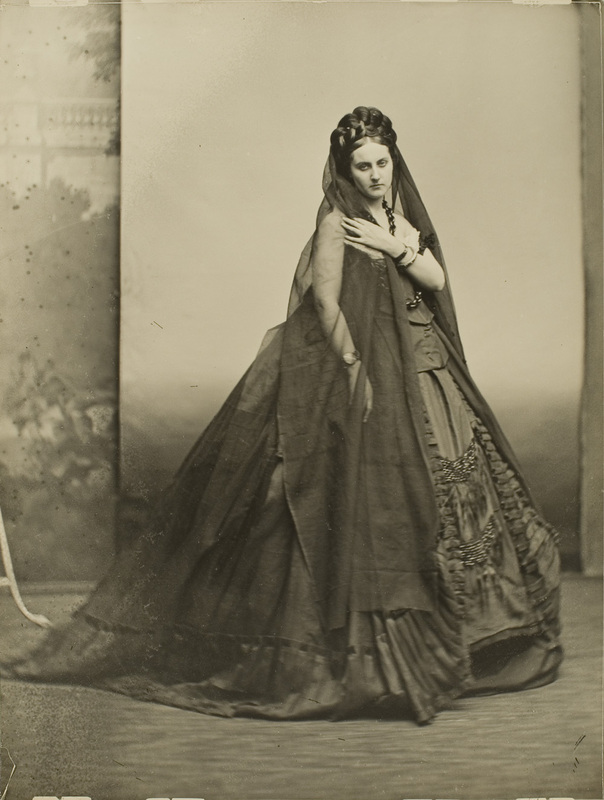 After the fall of the Empire in 1870, she lived more and more secluded from the world, keeping around her an atmosphere of mystery, exciting the curiosity of Robert de Montesquiou who developed a real fascination on her. They were never to meet, but he collected numerous objects previously belonging to her. In 1913, he published a book entitled La Divine Comtesse. La Castiglione died in 1899, aged 62. Virginia de Castiglione left a real imprint on her epoch: photographs of her regularly illustrated publications of the time. 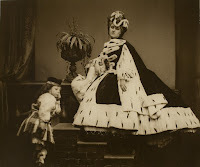 She was behind some five hundred photographs made during a forty-year collaboration (1856-1895) with the photographer of the Imperial Court, Pierre-Louis Pierson (1822-1913). Contrarily to common use, the countess chose her costumes, expressions, gestures and even the angle of the shot. She also defined the end product: portrait, calling card or painted print. She named each shot, sometimes after characters or scenes of contemporary theatre or opera: Scherzo di Folia after Verdi's opera, Un ballo in maschera, for instance.